The Olympus FTL is a 35mm SLR camera launched by Olympus in 1971, using the traditional 42mm screw-mount. It was replaced by the OM-1, which was presented at Photokina in 1972 and generally available shortly thereafter. 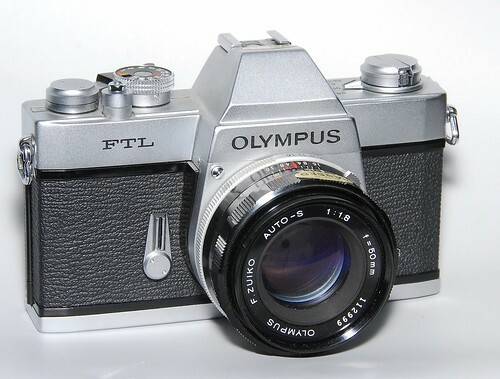 In an interview, a former Olympus designer said that the FTL was a stopgap model for the international market, made under pressure from the sales department. The chief designer of OM-1, Maitani Yoshihisa maintains that the FTL was not designed by Olympus, which means they have bought it. Never the less, the FTL and the OM-1 has many similar features, therefore, it is reasonable to expect suitable elements to be reused in the new camera. The Olympus 42mm lenses may not be optically the same as those for the OM system, but they are both Olympus Zuiko lenses, and all presumably made by Olympus. The FTL might seem like a traditional 35mm SLR camera, bearing a close resemblance to the Asahi Pentax Spotmatic, but it introduces full aperture TTL metering on a 42mm screw-mount camera. This is accomplished using a locking pin on the lensmount, enabling the aperture-ring setting to be accurately transferred to the camera. The screw-mount lens had been considered unsuitable for full aperture TTL exposure metering, due to the unpredictable stop position when screwed onto the camera, attributed to wear and production tolerances. A few years later, the Spotmatic F was equipped with a similar system where the aperture follower assembly is lined up with the lens by a notch at the back of the lens just before the lens is fully screwed home. Owing to the lensmount locking device on the FTL, a chrome button at 11 o'clock at the camera front must be depressed to remove the lens. The Olympus FTL, although otherwise traditional, is very well built and delicately finished, and undoubtedly built to the same high standards as associated with any Olympus products. It has a cloth focal plane shutter from 1 to 1/1000 sec and B. The through-the-lens meter has a match-needle visible in the finder. The system is similar to that employed in Minolta SR-T 101, but the follower needle is only connected to the aperture ring, while the shutter speed dial, including the film speed setting, actually rotates the meter movement itself. It seems the two cameras deliberately are made different at some points, like the robust hot-shoe on the FTL which is replaced by a removable one on OM-1, and the ON/OFF switch on the OM-1 lacks battery check position. The FTL is about the same size, but about 8mm taller and not so handsome. The screw mount Zuiko FTL lenses has an aperture-ring connecting-pin which may be obstructed by the body when mounted on other M42 cameras. However, the only known instance is the VEB Contax S family. The lens has a depth-of-field preview button, which might be left depressed if slid sideways. ↑ This page of the Maitani's fan page. Maitani's fan page has interesting information about Olympus internal story at the time, and publishes the two interviews cited in our text. This page was last edited on 13 December 2017, at 06:36.